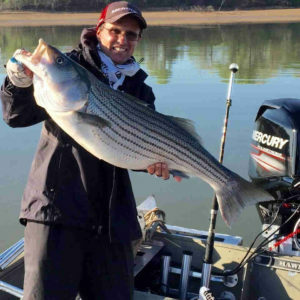 Imagine the thrill of bringing in a big, rod bending, line zinging trophy bass! 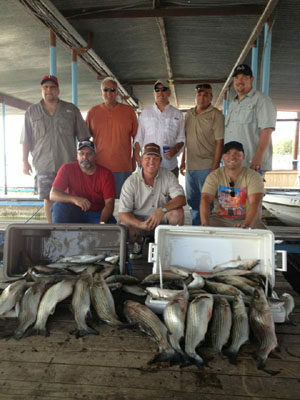 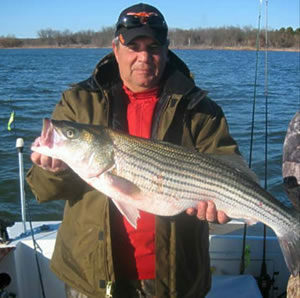 Lake Texoma is well know for its outstanding striper fishing. 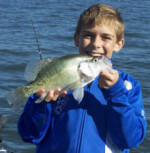 In addition, large and smallmouth bass fishing is very popular. 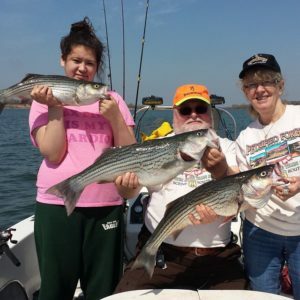 Lake Texoma Fishing Guides will make your day on the water a fishing trip memory that will last forever! 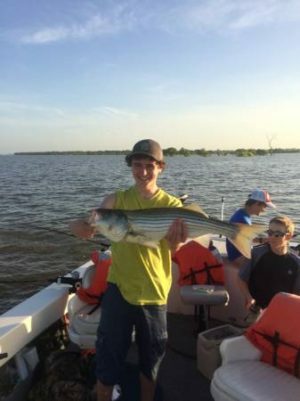 A fisherman’s paradise for Striped Bass, Black or Sand Bass, Crappie and Catfish, Lake Texoma offers something for every avid fisherman! 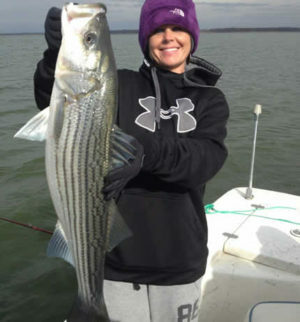 One of the few lakes were striped bass spawn naturally, Lake Texoma is formed by the Red River from the west and the Washata River from the north, which create deep channels and strong currents, long enough for the spawning process to occur. 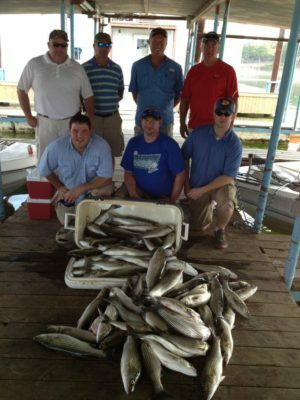 With over 89,000 acres of water and points of interest 25 miles apart, Lake Texoma is one of the largest reservoirs in the country. 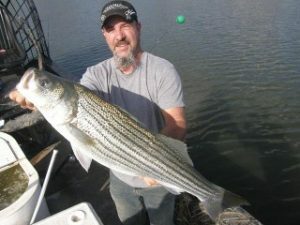 Monster striped bass are heavy feeders all year long. 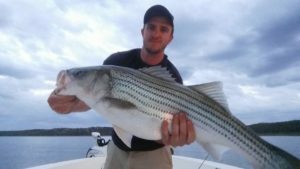 The guides on this page have a pretty keen knowledge of where those fighting stripers are likely to be at any given time and have the tackle, bait and electronic equipment to find them. 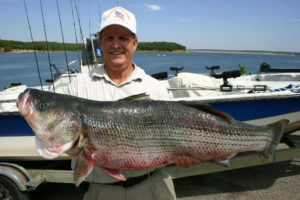 Lake Texoma runs along the border of Texas and Oklahoma, with much of the water being on the Oklahoma side. 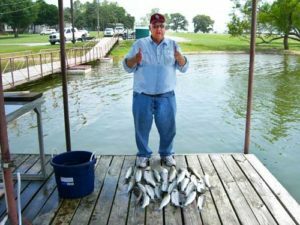 You will need fishing licenses for both states or a special Lake Texoma fishing license which allows you to fish all of the lake. 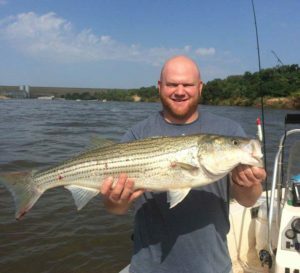 If you fish on the river from the shore, the appropriate state license is required but if you are “on” the river or wade in the water you will need an Oklahoma fishing license. 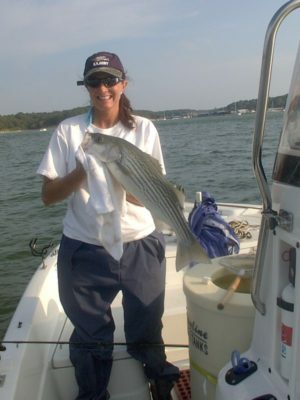 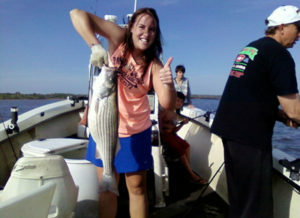 Carney Striper Guide Service has been creating striped bass fishing experiences on Lake Texoma for over 15 years. 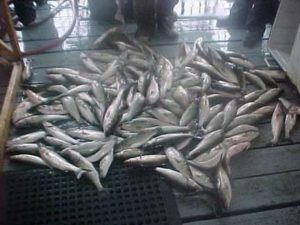 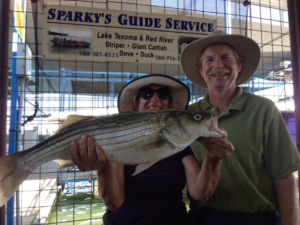 Come and catch the fever, Striper fever! 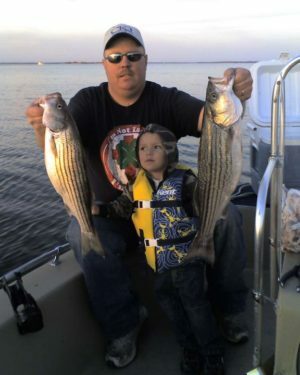 Foster Guide Service invites you to experience the thrill of Striper fishing at it's finest. 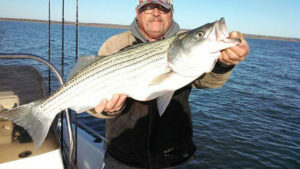 They are the "Texoma Connection" for the Striper fisherman. 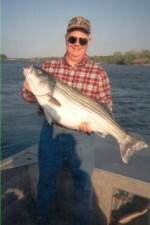 Captain John Seckman, Specializing in Striped Bass and Blue Catfish. 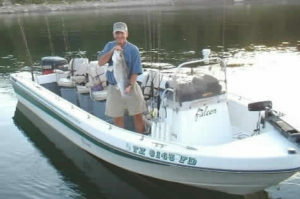 Fish the way you want to fish, morning, afternoon or night trips available. 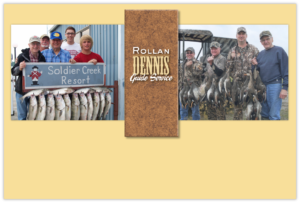 Business Address : 101 Pelican Dr. 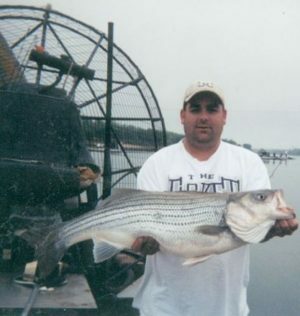 I fish year round and the colder months are best for bigger stripers. 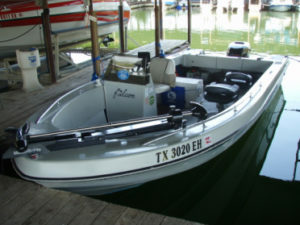 I provide everything needed for a fishing trip except for drinks, snacks and license. 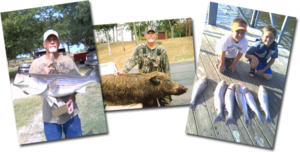 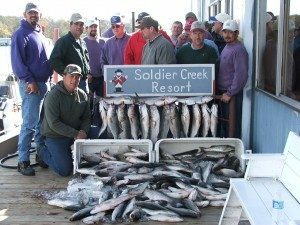 Business Address : 141 S. Meadowbrook Dr.
Anthony's Guide Service, guided fishing trips on Lake Texoma with Anthony Warren, groups of any size, bait, tackle, boat included, at the end of the day fish is fileted and bagged for you to take home. 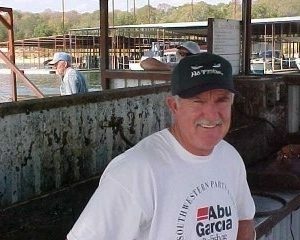 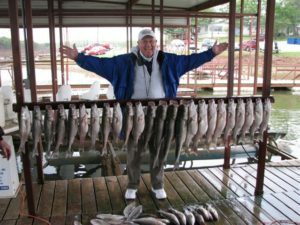 "We don't just go fishing, we catch fish"
Lake Texoma Fishing Guide Mark Banister with Adventure Texoma is a professional fishing guide out of Little Mineral Marina, Pottsboro, Texas. 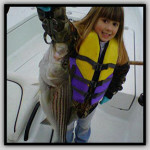 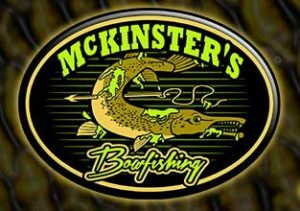 Mark specializes in creating a customized fishing experience for anglers of every age and skill level. 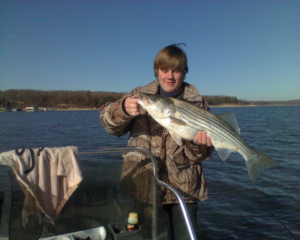 Welcome to Stephen Andre's Striper Hunter Guide Service where I specialize in catching Striped Bass on Lake Texoma using artificial lures. 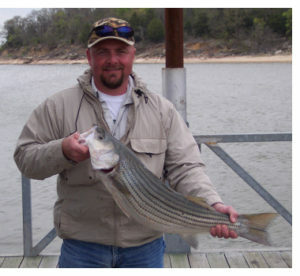 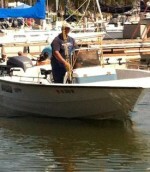 19 years experience on Lake Texoma. 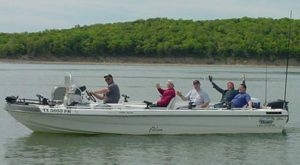 I will provide your group a large comfortable boat, and all the necessary gear for a successful and memorable trip! 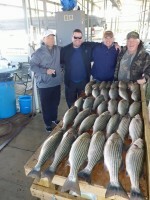 Boe's Guide Service, Mill Creek Marina, Lake Texoma - all tackle, bait, and equipment provided. 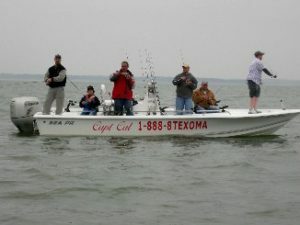 Providing guided fishing trips on beautiful Lake Texoma, Alberta Creek Marina, Kingston, OK. Our boat is truly one of a kind with a level deck, bathroom on board and is wheelchair accessible! 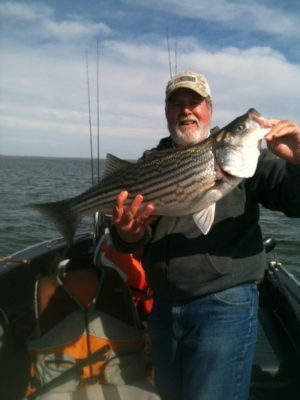 Captain Bill "Texoma Bill" Coleman has been fishing for Stripers on Lake Texoma since 1992, full time guide fishes out of a 23-Foot Falcon Striper Delux. 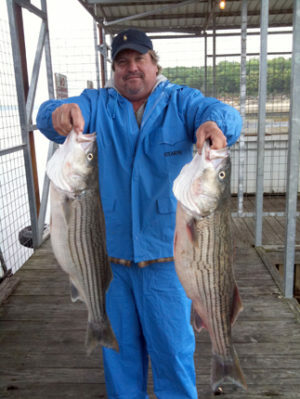 James Allen with Blue Water Striper Guide Service is a full time, year round, fishing guide on Lake Texoma. 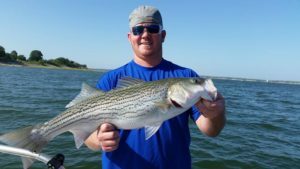 Cornett Guide Service fishing guides on Lake Texoma, provides a quality striper fishing trip that you will always remember! 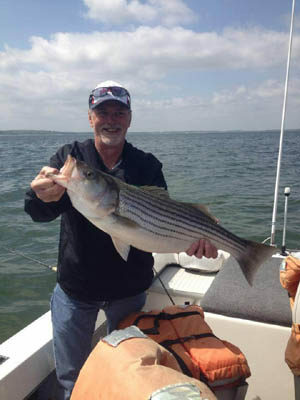 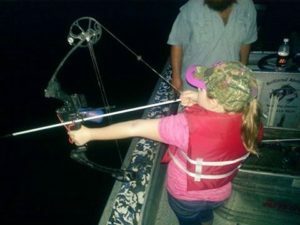 Lake Texoma Striper Guides Bill Carey and the Striper Express Team have created striper fishing excitement for their guests for nearly three decades on Lake Texoma. 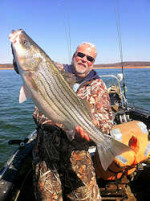 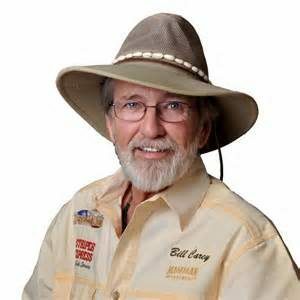 Dennis Rolland - one of the most experienced guides on Lake Texoma. 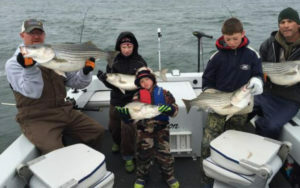 His guide service has two full-time boats available all year for striper or cat fishing.